Toyota has announced the recall of the Lexus ES 350 & IS 250/350 models to have their accelerator pedals reshaped and/or replaced. This recall is to be a permanent solution to the risk of unintended acceleration, no matter what floor mat is being used. Starting in early 2010, dealerships will be equipped to reshape the affected pedals by “shaving” a 3/4 inch from the existing pedal, followed by a brand new pedal in April 2010. In the case of the ES 350, the floor surface will also be reshaped. Both affected Lexus models will be receiving a new brake override system that will cut engine power if both the accelerator and brake pedals are pushed simultaneously. If you’re affected by this recall, I suggest reading the full press release after the jump. Torrance, Calif., November 25, 2009 – – Toyota Motor Sales, U.S.A., Inc. (TMS) announced today details of the vehicle-based remedy to address the root cause of the potential risk for floor mat entrapment of accelerator pedals in certain Toyota and Lexus models. Toyota issued a consumer safety advisory on September 29 on this issue and has, as an interim measure, commenced the mailing of safety notices to certain Toyota and Lexus owners on October 30. The models involved are: 2007 to 2010 MY (model year) Camry, 2005 to 2010 MY Avalon, 2004 to 2009 MY Prius, 2005 to 2010 MY Tacoma, 2007 to 2010 MY Tundra, 2007 to 2010 MY ES350, 2006 to 2010 MY IS250, and 2006 to 2010 MY IS 350. 1. 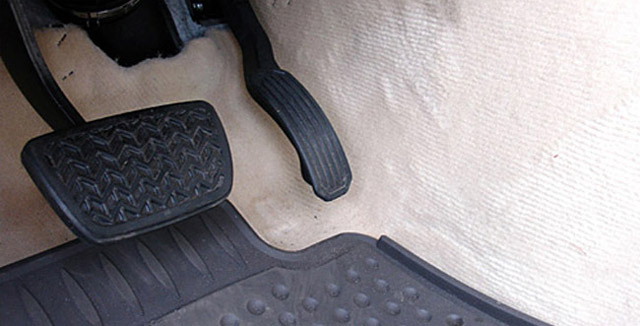 The shape of the accelerator pedal will be reconfigured to address the risk of floor mat entrapment, even when an older-design all-weather floor mat or other inappropriate floor mat is improperly attached, or is placed on top of another floor mat. For the ES350, Camry, and Avalon models involved, the shape of the floor surface underneath will also be reconfigured to increase the space between the accelerator pedal and the floor. 2. Vehicles with any genuine Toyota or Lexus accessory all-weather floor mat will be provided with newly-designed replacement driver- and front passenger-side all-weather floor mats. In addition, as a separate measure independent of the vehicle-based remedy, Toyota will install a brake override system onto the involved Camry, Avalon, and Lexus ES 350, IS350 and IS 250 models as an extra measure of confidence. This system cuts engine power in case of simultaneous application of both the accelerator and brake pedals. Toyota is in the process of completing development of these actions and for the ES350, Camry, and Avalon will start notifying owners of the involved vehicles via first-class mail by the end of this year. The remedy process regarding the other five models will occur on a rolling schedule during 2010. Dealers will be trained and equipped to make the necessary modifications to these models starting at the beginning of 2010. Initially, dealers will be instructed on how to reshape the accelerator pedal for the repair. As replacement parts with the same shape as the modified pedal become available, they will be made available to dealers for the repair, beginning around April 2010. Customers who have had the remedy completed will have the opportunity to receive a new pedal if they desire. In the meantime, owners of the involved vehicles are asked to take out any removable driver’s floor mat and not replace it with any other floor mat until they are notified of the vehicle-based remedy, as notified in the consumer safety advisory and the interim notice. The brake override system will be made standard equipment throughout the Toyota and Lexus product lines starting with January 2010 production of ES350 and Camry and is scheduled to be incorporated into new production of most models by the end of 2010. The safety of our owners and the public is our utmost concern and Toyota has and will continue to thoroughly investigate and take appropriate measures to address any defect trends that are identified. Owners who have further questions are asked to visit http://www.toyota.com or http://www.lexus.com or contact the Toyota Customer Experience Center at 1-800-331-4331 or Lexus Customer Assistance at 1-800-255-3987.